Bank Marketing Center - Bank marketing and advertising has never been easier. "The ease-of-use, customization and quality of the marketing materials enabled Anderson Brothers Bank to do a variety of marketing without the expense of outsourcing. It not only saves us money, but also enables us to create brochures, statement stuffers and other marketing materials that in the past we never had the time to develop in-house. With BankMarketingCenter.com, each branch has the capability of creating it's own community specific ads." "As a bank marketing consultant, I have never worked with a more service oriented company. Their technology is saving banks of all sizes from all over the country valuable time and money, while their compliance approval process is saving even more." "I have been very pleased with BankMarketingCenter.com, especially with the service they provide whenever I or one of our users has questions. Honestly, they couldn't have been more helpful and responsive. The system is easy to learn and use. We are located in northern Montana and all of our branches are located in different communities, so we all have different events to promote on the system. BMC has worked very well to accommodate our branch system and our communities. " Our web-based platform puts you in complete control of the marketing production process for your bank – all for a fraction of your current marketing costs. As a registered user you will have access to thousands of professionally designed marketing materials and over 8 million stock photos. In seconds you will able to create "camera-ready" artwork for publication or printing. Our technology allows banks to protect their brand and compliance, while allowing users in the branches to personalize and customize their own ads. 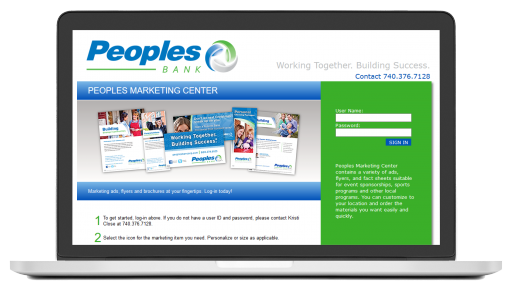 In addition to handling all the creative needs for community banks, we also offer private labeled marketing portals for large banks that have their own creative. See how Bank Marketing Center can save you valuable time and money. © 2019 BankMarketingCenter.com. All Rights Reserved.